Researchers at the Harbin Institute of Technology in China and the University of Michigan in the US demonstrated improved LFP battery cathode, augmented by reduced graphene oxide. 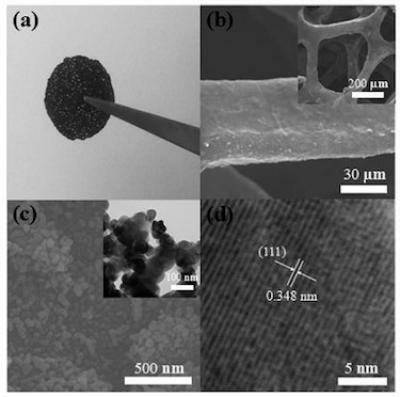 The scientists used reduced graphene oxide (rGO) in LFP battery cathodes to create a new high surface area 3D composite. LFP (or LiFePO4) is a kind of Li-Ion rechargeable battery for high power applications, such as electric vehicls, Power Tools and more. LFP cells feature high discharging current, non explosive nature and long cycle life, but its energy density is lower than normal Li-Ion cell. In this study, the researchers created the composite using a nickel foam template that was coated with layers of graphene oxide. The graphene oxide reduced as the LFP nanoparticles were synthesized in a simple technique that allows larger amounts of the LFP to be loaded into the carbon material. The layer-by-layer assembly technique also allowed the team to design a material according to its final function. In this case, the composite has a high electrical conductivity and is tough. The results of the study show that it is possible to produce batteries that are mechanically robust and also have a high conductivity. The researchers say that this new material may find use in flexible electronics, especially flexible energy storage. They are also attempting to tailor batteries for smartphones and tablets that feature fast charging times and find ways of improving other parts of the battery as well, like electrolytes and current collectors. Batteries for electrical vehicles could also benefit from these results, but will come at a later stage, once the safety of the high charge-discharge rates of devices have been fully evaluated.